SAM Leisure's Vintage Domestic range, crafted from the most durable hardwoods to ensure a long term investment as well as an aesthetic quality unrivalled in this sector. Models styled to suit every taste in a selection of wood finishes and cloth colours, combined to your own specification. Manufactured to the same exacting standards that have given SAM Leisure a reputation unsurpassed in the field of cue sports. The same stability, accuracy and consistency, found in SAM's commercial range. The biggest selling tables in Europe and those chosen for international tournament use in American pool, English pool and Carom. A truly continental feel to The Classic is accomplished with flourishing detail and tapering, trumpet turned legs. 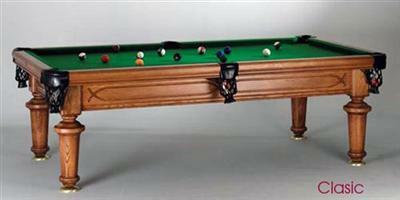 This table comes with matching diner top - hold a dinner party and then relax with your guests over game of pool.